Why Is MF Doom Releasing a Live Album? On September 14, weirdo indie-rap hero MF Doom will release Expektoration, his second live album. The question is — why? But as people who pay money for Doom tickets see it, they’re getting ripped off, plain and simple: Instead of a show, they’re getting a karaoke act. (And, generally, a bad one: check out a Doomposter getting booed off the stage at Rock the Bells a few years back). But how would a live album recapture the hearts and minds of Doom fans scorned? After all, the Doom on Expketoration is the real Doom, the one they would have been perfectly happy paying money to see in the first place. Assumably, Dumile sees Expketoration as a document of Doom live, in totality. This particular document should prove that if fans were disappointed by their personal experience with a specific Doom show, that was an aberration. He is attempting to bolster the legitimacy of the Doom live experience, all while never directly addressing the criticism of his Doomposters. It’s as if he’s convinced himself any criticism of his live show has nothing to do with the fakes. Basically, he’s addressing nonexisting criticism. And here’s where it gets really weird: Expektoration, to these untrained ears, sounds staged. As in, not actually live. 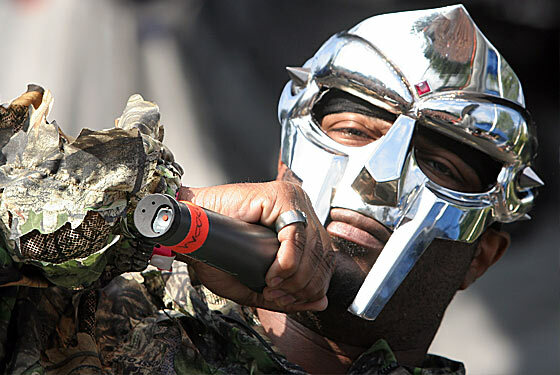 As in, MF Doom released a live album following a fake-live-show scandal, and that live album is not live. It’s certainly Doom’s voice, recorded live without any studio gimmickry, and there’s certainly a hype man there with him, shouting all manners of crowd-hyping platitudes. But are there actually people present? The noises of the crowd seem to pipe up, out of nowhere, at oddly appropriate moments, like whenever a song fades out, and then sharply disappear again. Doom addresses the crowd, they respond maniacally; he goes back to rapping, they evaporate completely. We hear “New York, let me hear some noise, ya’ll!” — and, on cue, a few seconds of response, then nothing. Cheers turn instantly to boos, and then quickly back again, with no explanation. Then again: Are we overanalyzing this because it’s Doom? Very possible! And more important, with all that said, Expektoration is kind of great. The show is introduced with a voice explaining that “expectoration, or spitting, is a common side effect of speaking Klingon. Until you’re used to it, keep a napkin, or handkerchief nearby.” Throughout the songs and the stage banter, there are all kinds of evil cackle sound effects. At one point, Doom starts talking, apparently in all sincerity, about a food drive organized at the show: “It’s a lot of children that go to bed hungry every evening. We brought in mad pounds of food.” (“200 pounds of food a night, 300 pounds a food a night,” the hypeman chimes in.) The whole album is split into three untitled tracks, and the middle one is a two-minute long stretch of Hammond B-3 organ laced with repurposed Star Trek dialogue (“Are you transporting Tribbles?”). It’s most reminiscent of those old Beastie Boy audio pastiches that were loaded with non-sequitur-y conversational chatter and snatches of random movie samples. Only, we remind you again, this is a live album. Expektoration was pasted together from several different live shows (circa 2004), which could certainly explain the odd listening experience. It’s certainly more plausible to think that the album was edited together strangely rather than faked all together. But there’s no getting around the fact that MF Doom’s live album at the very least sounds fake. Is this part of the canvas?